William of Mass Destruction: That's Right. No one was up here so I just poured myself in. Dude, you just barely fit. Isn't there another basket for you?? That basket was made just for you...purrfect fit! Elliott, what is this I hear about you not liking brushies? I'll transport over and take yours, OK? We think you fit in there purrfectly, Izzy! That looks like a perfect fit. We kitties are sort of one-size-fits-all. You look perfect in there. It was made for you! 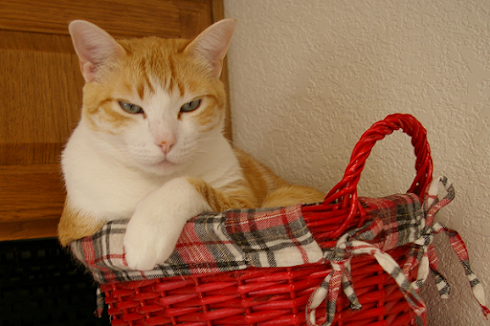 The red basket set off your ginger and white furs very nicely, Izzitz Bizzitz! You look at the camera as if to dare anyone to try to move you.